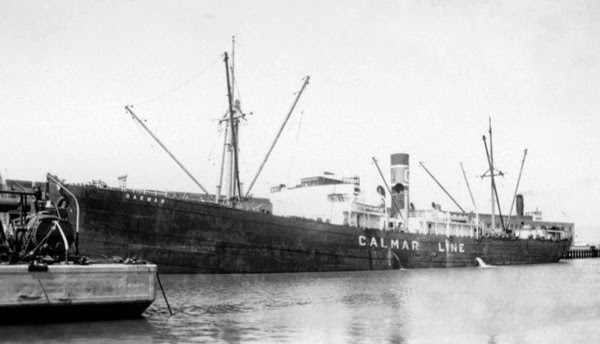 SS Oakmar while owned by the Calmar Steamship Company Inc., of New York 1927 – 1942. The US-flagged steamship Oakmar was built as yard number 33 by the Mitsui Bussan K. K. shipbuilders in Tamano, Japan in July 1920. Her original name was Eastern Exporter and she was commissioned for the United States Shipping Board. She was 385 feet long, 51 feet wide and 34 feet deep. Her gross registered tonnage (GRT) was 5,766 and a triple expansion steam engine developed 554 net horsepower, propelling the ship’s steel hull at 10 knots when built. In 1923 the Eastern Exporter was sold to the Garland Steamship Corporation of New York. 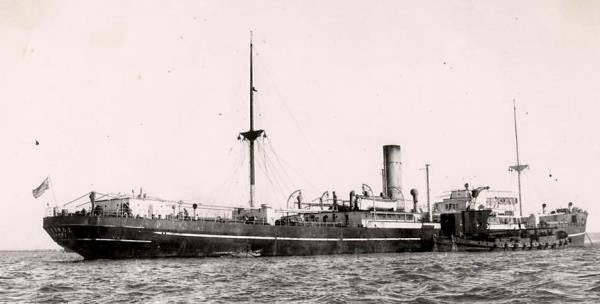 She was renamed the SS William Campion. In 1927 the Calmar Steamship Company Inc., also of New York, purchased the ship and renamed her the Oakmar. Calmar was a subsidiary of Bethlehem Steel and operated from 1920 to 1970. In the spring of 1942 the Oakmar found itself on passage between Calcutta, India and Boston, Massachusetts via Trinidad and, most likely, Cape Town for bunkers. Her cargo was manganese ore, rubber, and burlap. The 36 men on board were under the command of Captain Nolan Eugene Fleming, aged 44. There was a passenger working his way between India and the US named Herbert L. Jernigan. According to an 18-year-old oiler among the crew named Erio Pearson from Galveston, Texas, on the passage between Trinidad and Boston the ship evaded no fewer than four other German or Italian submarines in recent days. He said that “Every time a sub would get near us the captain would order full speed ahead. We got away four times…” Their luck was to run out on Friday the 20th of March, 1942. There was a ship about five miles ahead of Oakmarheading from right to left of them. This vessel turned out to be the Dutch motor vessel Talisse and her captain reported witnessing the attack on the Oakmarwhen he arrived in New York some days later. Built in 1930 and owned by the Netherlands Steamship Company of Amsterdam, the vessel was 8,169 GRT, 490’ long, 62.2’ wide and 29’ deep. M/V Talisse, which was five miles ahead of Oakmarand witnessed the attack. Conditions were bad – there was a very heavy sea running and the wind was blowing force 7 or 8, and so a fresh gale of 35 to 40 knots was blowing from the northwest. Visibility was good. Suddenly at 2:10 local, ship’s time the men spotted a surfacing submarine off the starboard quarter and heading towards them at at least 10 knots – some said as fast at 16 knots. The submarine was the German U-boat U-71 under Kapitänleutnant Walter Flachsenberg (soon to be promoted to Korvettenkapitän). They had entered the area northwest of Bermuda heading east on the 2nd of April. The day before the sub had sunk the Eastmoor, a British ship of 5,812 tons. While patrolling the east coast of the US from Hatteras to New York U-71 sank the Ranja on 17 March. Kapitänleutnant Walter Flachsenberg, Commander of U-71 which sank the Oakmar. 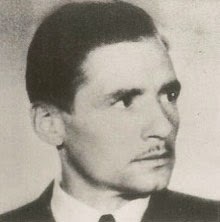 Walter Flachsenberg was born in 1908 and a member of the Crew of 1929, making him 33 years of age at the time of the patrol. He served with naval artillery from 1939 to 1940, when he joined the U-boat arm. The weather was so rough that Flachsenberg didn’t want to risk an initial submerged torpedo attack, preferring instead to disable his unarmed quarry with machine gun fire. Captain Fleming was a bold spirit, and turned the wheel hard to port to out-run his attacker. Fleming had the radio operator immediately send an SSSS signal, and it was acknowledged by at least five shore stations. The radio operator gave the noon position, course and speed. At 2:48 pm the Headquarters of the US Navy’s Fifth Naval District in Norfolk recorded the Oakmar’s SSS, “intercept on distress frequency.” The Eastern Sea Frontier Enemy Action Diary recorded that the Oakmar was “being pursued by a submarine” at 7:30 pm. It seemed the Oakmar might have a chance of outrunning U-71 until the U-boat opened fire with a pom-pom anti-aircraft gun located in the conning tower. The first tore into the bridge wing, the second landed in the chart room, and the third ended up on the deck. Captain Fleming presumed that these were warning shots, and he ordered the Oakmar stopped and the ship abandoned. He sent the ship’s confidential papers overboard in a weighted bag, lest they end up in enemy hands. When U-71 was only 100 yards away from Oakmar it began firing “in spurts” at the ship. Over the next 15 minutes some 30 to 40 shells were observed to have been sent at the merchant vessel. The Allied survivors thought they could read “SB118” on the side of the conning tower, and they saw four men on the tower. U-71’s emblem which may have been confused, from a distance, as an “S” by Oakmarsurvivors. After failing to sink the ship with gunfire alone Flachsenberg opted to fire torpedoes. At 2:20 pm local time he fired the first torpedo but it deviated in the heavy seas and missed. At 2:39 pm U-71 sent a second torpedo at the Oakmar, and this one hit just forward of the bridge. It had the effect of making the ship sink by the bows within a matter of minutes. The survivors in lifeboats, struggling to stay afloat, were unaware that torpedoes had been used. Flachsenberg never interacted with them. The sub motored away, submerged and unseen. These men also felt that had the Oakmar been armed they might have been able to keep U-71 submerged and perhaps avoided being sunk. Probably Flachsenberg only surfaced after ascertaining that the ship was unarmed and could not counter attack. Meanwhile, according to the Naval Operating Base in Bermuda records, a craft named “R-6” was sent to “proceed to assist OAKMAR and attack enemy forces.” The 28 US sailors and two Norwegians in the large lifeboat did not know this. They were facing a very rough night ahead of them on the open seas. It would be too dangerous for the Talisse to turn back and rescue them. They were on their own. Another member of the lifeboat crew, William Teffner, aged 27 and also an oiler, from Landsdowne, Maryland, said that “Some of the fellows in the boat didn’t even have their pants. They just had life preservers and pajamas.” It must have been bitterly cold in the North Atlantic in mid-March. As for the four men in the port lifeboat, struggling in the seas without enough men to man the oars, Captain Fleming, First Assistant Engineer Floyd Thomas Ireland, Messman Robert Eugene Lang, Steward Cyril Alexander Ogle, Messman Elmer Dewitt Richardson, and Able Seaman John Wise Hartley would never be seen alive again. As terrible as their ordeal in the open boats was, for the 30 other men, it only lasted just over two days, or 54 hours to be exact. At around 8 pm on Sunday the 22ndof March they managed to attract the attention of a Greek steam ship named Stavros which was sailing for the neutral Swiss government. The Stavros of 4,853 tons was built in 1925 by Furness Shipbuilding in the UK and in 1942 was owned by the Kassos Steam Navigation Company, Ltd. of Syra, Greece. In March 1942 she was on charter to the Swiss government. Her previous names were Ashleigh and Kingston Hill. 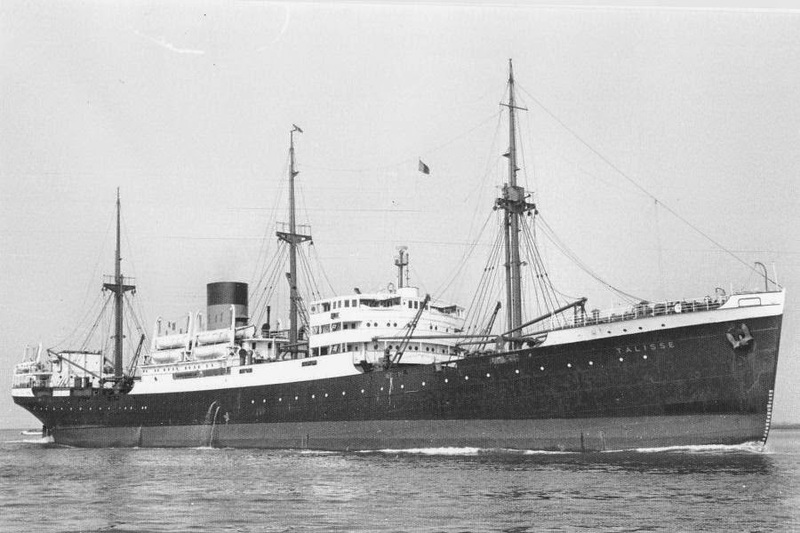 The Greek SS Stravros which rescued 30 survivors of the Oakmar on 22 March 1942. Photo source: http://www.uboat.net/allies/merchants/1650.html, courtesy of the Library of Contemporary History, Stuttgart Switzerland. The Stavros arrived in Hamilton, Bermuda at 5 pm local time on Tuesday the 24th of March. Two of the crew were hospitalized on the island. The commandant of the NOB base in Bermuda, Admiral James, contacted the US Consul General on the island regarding processing and repatriating the 28 Americans and two Norwegians. Most likely the survivors were put up in the Bermuda Sailor’s Home and in local residences – the local Gazette didn’t record their arrival. U-71 followed the Oakmar sinking with a successful attack on the Dixie Arrow, but the sub was chased off by the USS Tarbell, resulting in a depth charge attack. On the 31st Flachsenberg found and sank the British ship San Gerardobetween New York and Bermuda. U-71 sailed with the 7th U-boat Flotilla from Saint Nazaire on the 23rd of February and returned to La Pallice France on the 20th of April 1942. After six patrols of 191 days in U-71, in late 1942 he moved to torpedo testing command until the surrender. Between March and April 1942 he sank 5 ships of 38,894 tons – all on this patrol, and he received no decorations. Flachsenberg lived until 1994 and age 86. Stavros had an interesting war. Less than two months after rescuing the Oakmar men she was herself attacked, by U-593 under Gerd Kelbling. In the morning of 14 May 1942 Kelbling put a torpedo into the mid-section of the ship southeast of New York before realizing it was sailing under neutral Swiss markings, at which point the U-boat broke off the attack. The Stavros was salvaged, repaired, and placed back in service. It survived the war, was sold to Costa Rica in 1953, Panama in 1960 and Japan for breaking up in 1962. Frederick, Maryland “News,” April 6, 1942, “Ship is Sunk After Flight from U-Boats – Survivors Tell of Effort to Escape from Enemy,” same AP wire story as Zanesville Ohio paper at bottom, from www.newspaperarchive.com.